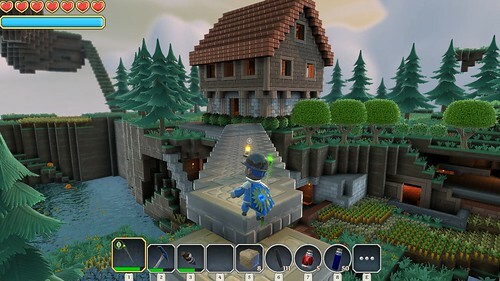 Switching over to the other game, Portal Knights has been in beta for a while and just came out very recently, and Col has been playing it but I was involved in Marvel Heroes and wasn't paying too much attention. Then it went on sale and Col bought it for me as a gift because he thought I would like it, which was really nice of him! 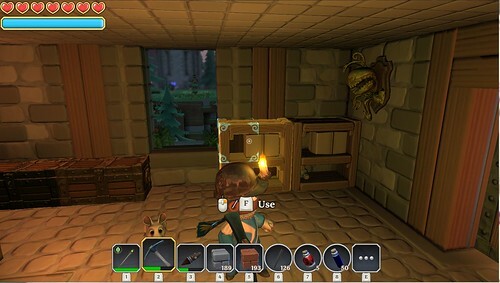 It's sort of like Trove in that it's got the Minecraft-style building component and it's also got some questing/PvE to it - a little more actual story than Trove had, as I recall. Here's a shot inside the house that's really not too interesting. I didn't make much in the way of changes to this floor - I just added some chests and stuff for storage. That thing on the wall is a trophy - that's the head of one of the mobile plants that I was talking about. This is not a big room, you're seeing most of it. There are stairs which originally just went up, and a fireplace, and there were originally some chairs which I moved.